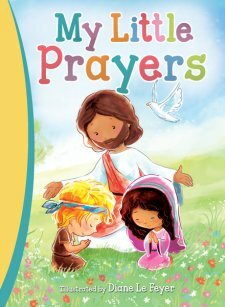 Book Review: "My Little Prayers"
The cover has captured my heart, I adore the cute little pictures and the colors the illustrator used. I am loving this adorable little book that gives some great ideas on how to pray over different areas such as on a birthday or sitting down to eat. The book covers these topics: My Day, My Mealtime, My Bedtime, My Family and Friends, My Feelings, My Special Days, and My Time with God. Each section is going to be awesome for all ears to here so when they start praying they will have many ideas from this book. I think many kids of a wide range of ages can enjoy this book. My eight year old is reading it to her 5 year old brother and the both have enjoyed this book! Thank you Booklook program for sending me this book in exchange for an honest review. I wasn't paid for this review and all opinions expressed are 100% mine.